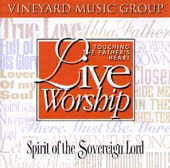 Spirit of the Sovereign Lord: Vineyard Music EXTRA! If you are familiar with the Brownsville revival in Pensacola Florida you have heard this title track referred to as The Year of the Favour of the Lord. The original has a biting rock edge with searing guitar and a nice back beat. Break dividing walls another theme song of revival is just one of 5 songs by Pastor David Ruis from Winnepeg Canada. I said Ruis had received the music ministry mantle from the late great Keith Green before finding out he worked with Keiths widow Melody before that ministry group hooked up with YWAM (Youth with a mission). Let the winds blow and There must be more are highlights in this set. Cindy Rethmeiers Abba Father and Hide me in the shelter are also personal favorites of mine. Abba Father was also recorded on her solo childrens album I want 2 be like Jesus also on VMG. Crowns down written by Norm Strauss is a hard rocker in the vein of Neil Young . I dont usually like to compare spiritual music with secular but as Ruis is quoted in the book Thoughts on worship, this kind of rock music (i.e. U2 etc.) is our heritage. If I was only able to take a few CDs to my exile on a desert island this would be included in my backpack. This one will Awaken the song in your heart.